he 81st Airborne Anti-Aircraft Battalion (AAA) was activated on 4 Sep 1942, by General Order #8, HQ 101st Airborne Division at Camp Clairborne, Louisiana. 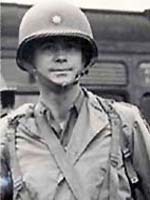 The battalion, commanded by Lieutenant Colonel W. C. Scoggin, was a special troop unit of the 101st Airborne Division and was activated from units of the 401st and 327th Glider Infantry Regiments. All personnel were infantry trained. All personnel above the T/O of 71 men per battery, 23 men of Medical Detachment and 26 men of Headquarters Detachment were transferred out to other units of the division. Batteries A, B and C were anti-tank batteries, each with eight 37mm A/T guns, which were changed to 57 mm gun and then to the British six pound guns for combat, as they were more suited to gliders. Batteries D, E and F were anti-aircraft batteries, each with twelve 50 caliber air-cooled machine guns on M-3 mounts. After Normandy, ground mounts were secured so the guns could be fired as ground weapons to support the infantry units of the division, who had only 30 caliber air-cooled machine guns. The battalion moved to Fort Bragg, North Carolina, with the division, on 29 Sep 1942. Training began on the new weapons, loading of gliders, taking glider flights and unloading the gliders. The battalion participated in all division exercises and maneuvers. The division was scheduled to sail for England 5 Sep 1943, from Pier 90, North River, New York. The battalion was assigned as advanced party to the ship, to furnish all fatigue details, ship security and manning the ship's AA guns, with Lieutenant Colonel Scoggin commander of troops aboard ship. The Ship 294 (HMS Samaria) landed at Liverpool, England, and the battalion moved by train to Basildon Park, near Reading, Berkshire. Training was intensified on physical training (including long and short marches), firing of weapons, glider loading, glider flights, unit and division tactical exercies. On 25 Mar 1944, Lieutenant Colonel Scoggin was transferred and Lt Col X. B. Cox Jr. (picture above right) was given command of the battalion and remained in command for the duration. On 6 Jun 1944, Batteries A and B were air lifted by glider to Normandy, France, where they landed at H+2 hours. Batteries D, E, and F came in by sea with the assault wave of engineers and infantrymen of the 8th Infantry Regiment, 4th Infantry Division landing at H+15 minutes. They set up the first anti-aircraft protection on the beach and remained in this position until 11 June, when they were released by 7th Corps and returned to battalion control, so they could set up AA protection for division headquarters and major bridges around Carentan. The batteries were given credit for at least two enemy planes destroyed during 6-7 June. The next combat operation the Battalion would participate in would be Operation “Market Garden,” the airborne invasion of Holland.The Battalion, along with allied units, endured 73 days of continuous combat. After the fighting settled down, the 81st occupied the front lines for 48 days until ordered to withdraw from Holland.The Battalion went back to France to rest and recuperate before the next operation. On 16 December, 1944, the Germans launched an offensive in the west through the Ardennes Forest. The 101st Airborne Division was ordered to the vitally important town of Bastogne. Bastogne was the key to the German counteroffensive and had to be held at all cost by the 101st. The Regiment arrived at Bastogne on 19 December following a hundred mile truck march. By 22 December the Germans had completely surrounded Bastogne and on the 23rd the German Commander offered terms of surrender to General McAuliffe, the acting Division Commander. His reply was “Nuts.” The German delegation had come through the 327th sector and Colonel Harper was given the responsibility of relaying General McAuliffe’s response.The Germans said they did not understand. Colonel Harper replied, “The reply is decidedly not affirmative - in plain English, it is the same as ‘Go to Hell.’ Although encircled and outnumbered, American forces withstood all attempts by the Germans to take positions, including Germans dressed in American uniforms. The 101st held for nine days, until relieved by the 4th Armored Division. After they were relieved at Bastogne, the 101st Airborne held a line along the Moder River for over a month as part of the US 7th Army. On 23 February, the Screaming Eagles were relieved and returned to Mourmelon, France. Here General Eisenhower spoke to the 101st Airborne Division when the unit was awarded the Distinguished Unit Citation for its stand at Bastogne. This was the first time in the history of the United States Amy that an entire Division had been so honored. As the war in Europe was nearing its end, the 101st moved to the Ruhr Pocket on 2 April to help in mop-up operations. Here the division went on the line facing the Rhine River south of Dusseldorf, Germany. On the 4th and 5th of May, the 101st received and carried out its final wartime mission - the capture of Berchtesgaden, Hitler's Eagles Nest. Returning to France in September, the soldiers continued waiting for transport stateside. The 101st Airborne Division was in deactivated in December of 1945.